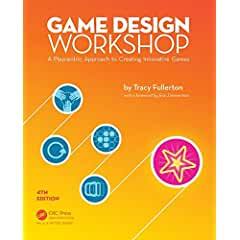 CRC Press has published Game Design Workshop: A Playcentric Approach to Creating Innovative Games, 4th Edition. Discover an exercise-driven, non-technical approach to game design, without the need for programming or artistic expertise with Game Design Workshop, Fourth Edition. Tracy Fullerton is an award-winning game designer and educator with over 20 years of professional experience, most recently winning the Games for Change Game of the Year Award for her independent game Walden, a game. She has also been awarded the 2016 GDC Ambassador Award, the 2015 Games for Change Game Changer Award, and the IndieCade 2013 Trailblazer award for her pioneering work in the independent games community. Tracy is a Professor of Interactive Media & Games at the USC School of Cinematic Arts and the Director of the USC Games Program, the #1 game design program in North America as ranked by the Princeton Review.